I’ve decided to start doing typing videos of all my new keyboard builds. Every keyboard I’ve built or used has its own unique sound. Some are very ‘pingy’, others have a low chock sound, others are more crisp. Every keyboard feels different, every keyboard sounds different. It’s worth documenting. This board, my Iris with Alps SKCM brown switches produces a mostly low thock sound, with light pinging from some of the outer edge keys. Last year I wrote a post detailing my solution for zero-knowledge unlimited cloud backup. The solution was reliant upon Amazon Cloud Drive for storage, ODrive for sync, and Boxcryptor for client-side encryption of content before it was uploaded to the cloud. This three-pronged backup solution was excellent for a long time. I’ve been very happy with Boxcryptor, especially as its mobile app has improved significantly since that original blog post. Like all good things, this solution had to come to an end - specifically because Amazon killed the ‘unlimited’ storage option for Cloud Drive at the beginning of this year. ACD moved from $60/year to $60 per terabyte per year. This pricing is still extremely competitive, but not budget friendly for me. I have a media server with ~8TB of content, if I’d stayed with Amazon my yearly bill would be nearly $500 a year! It was time to change providers, and I needed something for both backup, and day-to-day cloud storage. Fortunately, I was able to find an alternate solution: Backblaze & iCloud Drive. I had initially hoped to find some other vendor who could give me a single unlimited platform for storage + backup. There are options out there, but none of them were practical for what I wanted - namely ease of using while mobile. In the end it was necessary to use two different providers to achieve what I wanted. I ended up deciding to roll all my day-to-day storage needs into iCloud drive. The $2.99/month plan is very competitive, offering 200GB of storage. iCloud drive has come a long way since I tried it out as a cloud storage solution a few years ago. The sync is now fast, and reliable. Boxcryptor is also compatible with iCloud drive, so I was able to continue using that to encrypt my content before it was uploaded to the cloud. Backblaze offers several cloud-storage and backup solutions. Their B2 service is comparable to Amazon’s S3 offerings, and they’ve got a great consumer product that is billed as ‘unlimited backup, including external hard drives, for only $5/month’. B2 is in many ways focused on business clients - those who will be uploading and downloading a lot of content regularly. For the backup needs on my media server, I only ever plan on downloading data in the event of a total drive failure, so I opted for the $5 backup product instead. Backblaze bills their backup service as unlimited, but I figured that at a cost of a mere $5/month it was too good to be true. It turns out, they mean what they say. It really is only $5/month, and it really is unlimited. I’ve been using Backblaze for several months now, and have thus far uploaded multiple terabytes. With as much content as I have, and with limited upload speed (10 megabits), I’m actually still performing the initial backup. Backblaze’s UI is pretty easy to use. Following installation there is a preference pane in System Preferences. From there you can configure which drives you want backed up (yes, they’ll also backup your external drives as long as they’re connected at least once a month), what you want excluded, and how much upload speed you want to use. The preference pane is a set-it-and-forget-it deal. Once you get the initial backup going, Backblaze’s client just does its thing, there’s no need to think about it. For a security wonk like me, moving to a platform like Backblaze was a big leap. They offer very good security though. By default, all content uploaded is encrypted in transit. There is also the option to set your own custom key so that content is encrypted at rest, unreadable by Backblaze. Naturally, as with any encrypted platform, you have to place trust in the provider that the security claims they make are true. I’m still wary that Backblaze might have some way of seeing content at rest, but I’m mostly trusting. In the event that one does need to recover data from a Backblaze backup, they offer several options. One can download files that need to be recovered using their web interface, or there is an option to have a drive (up to 4TB) shipped to you. With the drive option, there is a $190 fee, but Backblaze says they’ll refund that to you if you return the drive back to them after you’ve gotten what you need off of it. I’m not quite sure how they handle situations where you need more than 4TB of data recovered - I can’t imagine too many of their customers have that much data backed up. I’d assume that they just ship multiple drives. I hope I never need to find out. If you want to try backblaze, they have 1 month trials available here. Full Disclosure: This is not a sponsored post. The above link is a referral link. In the event you sign up for Backblaze using this link, I will receive 1 free month of service. Today I received the Stapleberg controller (and associated electronics) from a recent group buy on Reddit. The Stapleberg PCB is a drop-in replacement for the control electronics in modern Kinesis Advantage keyboards. While Kinesis boards have some level of on-board programming ability by default from the factory, the default programming options aren’t nearly as flexible as my favorite keyboard firmware: QMK. 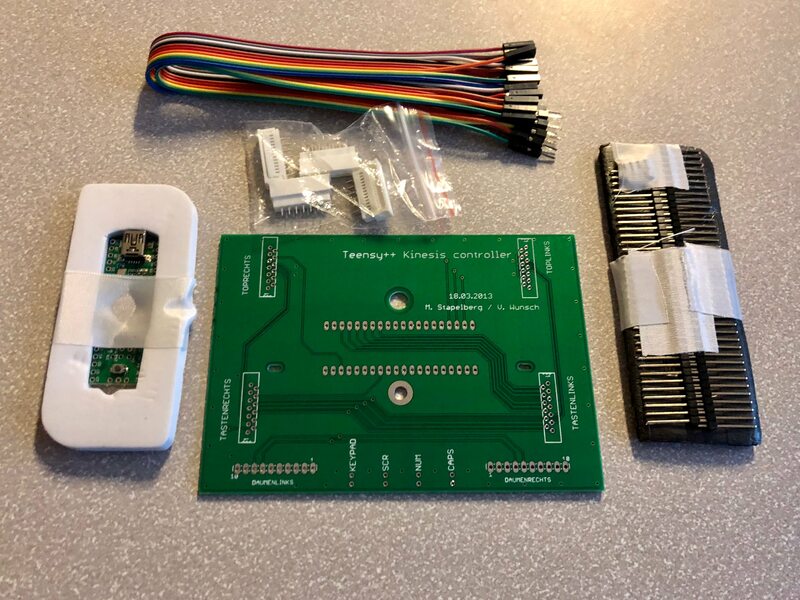 Designed by Michael Stapleberg, this controller provides an easy way to control a Kinesis Advantage using a Teensy++ development board. His custom-designed PCB connects the Kinesis’ existing circuit boards to the Teensy. 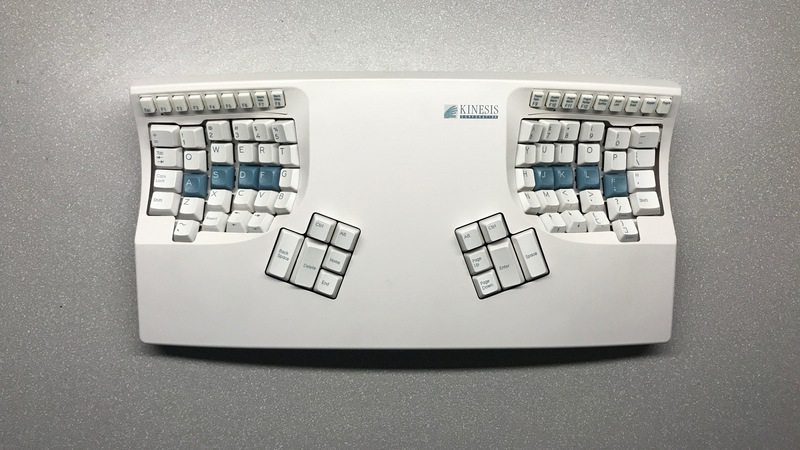 As a result of his work and reverse engineering of the Kinesis key matrix, it’s no longer necessary to hand wire connections to the various matrix boards inside the Advantage keyboard. I’ve long been fascinated with Kinesis Advantage keyboards, since before I was even a keyboard wonk. I remember first seeing them in Men In Black, noting how out-of-this-world they seemed. In February last year, I got my hands on a Kinesis Contoured Model 110 (pictured above). The Model 110 (circa 1991) is visually very similar to the modern-day Advantage boards, but its internals are significantly different. I do believe the cases are identical, however the keywell and thumb cluster PCBs aren’t the same in any way. I bought this Stapleberg controller with the intent of using it to modernize my Model 110. As it turns out, the Stapleberg is only compatible with modern Advantage style keywell and thumb cluster PCBs, so I will need to source all new internals for my Model 110 - this isn’t a big deal though as my Model 110 isn’t fully functional anyway. In order to complete this rebuild, I’ll likely need to replace every single internal component in my Model 110, but the result will be a fully modern, fully programmable keyboard. Four times larger = four times the fun! Today I’m opening the BIG SERIES switch from NovelKeys. This mechanical key switch is manufactured by Kailh, and is 4x larger than a normal switch. The switch is fully functional, and could be used to make a functional keyboard. The switch featured in this version is the tactile variant. Also available are clicky and linear switches. The BIG SWITCH is available for $30. Sometimes a product comes along and changes everything. A single product has the potential to change the world; not on its own, but through its influence. iPhone is that product for my generation. iPhone completely changed what a computer can be, what mobility can be, what communication can be. Of course, the 2007 product was slow, limited in capabilities, and didn’t even have a third party app store - yet it changed the world. iPhone showed the world that a handheld device can have real communication to the internet, can have a large touch screen, can do all you dream it can do - as long as you make the software. Before iPhone, mobile handsets were profoundly advanced, but only through a myopic view of what mobile technology could be. They all had crummy little screens, physical keyboards, and a set of predefined features when they shipped. They could technically connect to the internet. They could technically send emails. They could technically send text messages, but couldn’t do much beyond that. Today - all phones have touch screens. All phones have access to millions of applications. All phones have INCREDIBLE cameras, video, audio, unlimited communication potential. iPhone is directly responsible for Uber, Instagram, Square, SnapChat, Periscope, and many many others. Today we live in a world where everything is accessible to our fingertips wherever we are in the world. All because of iPhone. iPhone was the beginning of a revolution. iPhone X is its realization. Every iPhone Apple makes is always the best iPhone ever made. Every iPhone I buy (and I’ve owned quite a few) is always the best iPhone I’ve ever owned. iPhone X though, is something special. The experience of using iPhone X is fundamentally different than every one that preceded it; it breaks all the rules on how an iPhone should work, and is very much the better for it. I typically buy the new flagship iPhone every year, like clockwork. The only series I didn’t have was the 6S. Every year I watch Apple’s keynote, get excited about the new changes coming to that year’s phone, then inevitably buy it. Through small methodical advancements Apple builds up the platform, always pushing things forward and building on their past achievements. Retina display, Siri, TouchID - each seemed like a small leap, but they all pushed iPhone forward, pushed the industry forward. With so many phones over so many years, every new iPhone started to feel almost pedestrian to me. The new iPhone was always better, but deep down it was really the same as last year’s phone. New iPhones started to feel - boring. iPhone X is different. For the first time in years I was beyond excited. iPhone X is different, not for the sake of being different, but because major changes are needed to reinvent what iPhone can be. For ten years the defining characteristics of an iPhone were its display, and home button. iPhone X completely eschews the home button - the primary physical interface of the device. With the display now the solitary input, Apple added intuitive gestures to control navigation. A swipe up from the bottom of the display goes home. A swipe up, followed by a pause gets multitasking. A swipe down from the top left gets Notification Center, top left gets Control Center. These gestures make iPhone X feel alive, in motion, attentive to its user in a way iPhone hasn’t felt in years - not since the IDEA of a touch screen phone was still a novel concept. I won’t deny that I found the first day or two a bit difficult. I would reach down to find the home button that simply wasn’t there - but as I used iPhone X I quite simply forgot about the home button. The gesture system is so effortless, so easy, so responsive that it’s easy to adapt to it very quickly. The gesture system is absolutely and fundamentally BETTER than a home button. It feels as though X is what iPhone was designed to be all along - that the home button was a mere stopgap until the technology caught up with Apple’s vision. With iPhone X Apple did away with another important feature: TouchID. Instead, iPhone X relies on FaceID for authentication. Just a few years ago most people didn’t even have a passcode, let alone biometrics. TouchID was the system that finally made security easy. It wasn’t necessary to type in a passcode anymore; simply lay your finger down, and you’re in your phone. FaceID makes security even easier, it achieves what TouchID never could: ambient authentication. With ambient authentication, all biometrics are automatic. The device does all the work without you ever thinking about it. I never think about authenticating when I open iPhone X, I simply wake the screen (by tapping it), then swipe up - FaceID does the rest. As soon as the display is on FaceID begins is authentication process. The process is incredibly fast, by the time I’ve finished swiping up, FaceID has already authenticated me. It’s like having no passcode on my device at all. FaceID is effortless, by contrast TouchID felt like so much work. TouchID ratcheted security forward across the entire phone, not just unlocking. TouchID is what enabled SO MANY apps to begin using biometrics too. On my phone I have many apps that need biometrics to open - Outlook, LastPass, Capital One, Wells Fargo, LastPass Authenticator, and more. While TouchID enabled these security advancements, it also created a a modal method to authentication. Any time I wanted to open one of these apps I needed to take my finger off the screen, put it on the TouchID sensor, then wait for authentication. With FaceID I simply open the app, and FaceID ambiently authenticates me. This doesn’t sound like a drastic change, but the experience is magical. It’s security that ‘just works’ in a way it never has before. Ambient authentication allows security to be ratcheted for even small things, all without a user noticing. By default, when iPhone X’s display is turned on (by merely touching it), any notifications on the lock screen are generic, showing only what app the notification is from. Any passerby who grabs your iPhone X has no way of knowing what the notifications are. When you grab your phone, FaceID automatically sees you, authenticates you, then shows you the full notification. This sort of security was possible on older phones, wasn’t nearly as effortless to achieve. FaceID has also proven to be more reliable, and less prone to false negatives than TouchID. Because of its neural framework, you can train FaceID to recognize you in almost all circumstances. It’s very rare that I get a false negative with FaceID - maybe once or twice a day. I used to get false negatives 10 or 15 times a day with TouchID - either due to mispositioning my finger, sweaty fingers, and the like. In a word, iPhone X’s display is: stunning. I remember taking it out of the box and remarking (while laughing) that “It’s just…it’s just all screen.” Apple’s chief designer Jony Ive has long said that one of Apple’s goals is to make the technology ‘disappear’. With its all-screen design, Apple has achieved this goal in a way no preceding Apple product has. There are no large bezels, no buttons to distract, there is just simply: the display. Everything else falls into the background. The content you want to see is right there, front and center. It’s difficult to imagine what the experience is like when just looking at pictures of iPhone X; it’s as if I’m just holding a magical window. A portal to another world, a portal you can fall into and immerse yourself in. It’s huge, and beautiful, and blends into the design of the phone. The display’s rounded make it feel more organic, as if the display is bending the phone into it, as opposed to the phone allowing the display to rest on top of it. With iPhone X, the device really is just all screen. It’s just a rectangle with rounded corners in the best possible way. I’ve had iPhone X for two months now. I can conclusively say that it’s the best iPhone Apple has ever made, and the best one I’ve ever owned. It’s fast, it’s fluid, it’s fun, it’s whimsical. The entire phone feels more responsive, easier to use. It feels - personal. It feels like magic. iPhone X doesn’t feel like this year’s flagship phone, let alone next year’s. iPhone X is like something out of a time machine. Some representation of what a phone might be like in 5 years, yet it’s here today. It’s iPhone reimagined in the best way possible. I can’t fathom what Apple might do next.